Because granite is a natural material and is mined from the quarry in blocks usually no more than 10' long, you will most likely end up with seams. Also, because granite is sold in rectangular pieces, you may want to use seams to reduce your costs, such as in an ("L)" shaped corner. The visibility of seams will depend on the granularity, color and pattern. A small, uniform grain (such as Uba Tuba) will not be as apparent as a larger varied grain (such as Peacock Green). A dark color (Platinum) will be less apparent than a light color (Imperial White). A dramatic pattern with swaths of color (Kinawa, Paradiso) will show more seams than a uniform pattern (Dakota Mahogany). 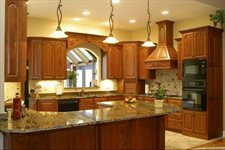 Most customers have found that the beauty of natural granite outweighs the concern of seams.